The recent events in Charleston put me in mind of a personal story I’ve never told. When my son, Wesley, was 3 and in preschool, one of his friends was another 3 year old named Grace. She was a very sweet girl. 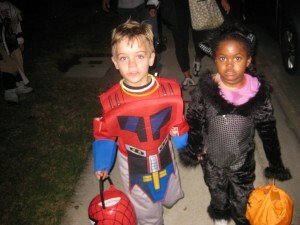 When they all went trick-or-treating for the first time, Wesley and Grace were walking from house-to-house holding hands. Later that year, on MLK day, Wesley was taught about black and white people. I remember being torn about it. I wanted him to know that Martin Luther King was a great man, but I also believed that until that moment, Wesley never saw that there were any black or white people. Just people. Here’s a picture of Wesley and Grace holding hands as they went house to house. Kids are colored blind. Kids are also all the same: they love to laugh, they love to have fun, they love to be involved. 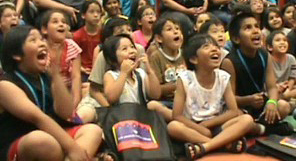 They don’t want to just sit there and watch “a magic show.” They want to do magic! Even more than that, children love to feel empowered. They live in a world where adults have all the power over them. When they can feel they have power over an adult, that is a joyful experience for them. Usually, it’s the first time they feel that powerful feeling. That is what the Jersey Jim Comedy Magic show does for kids. Every routine is designed to impart this feeling to children every 5 to 7 seconds. That is why children love Jersey Jim! This entry was posted in What's Jersey Jim Up To? on June 23, 2015 by Jim. Christmas Magic Show by Jersey Jim! Jim’s Christmas Bunny Rabbit, Snowflake, will be magically appearing straight from the North Pole. The kids love seeing a live bunny! 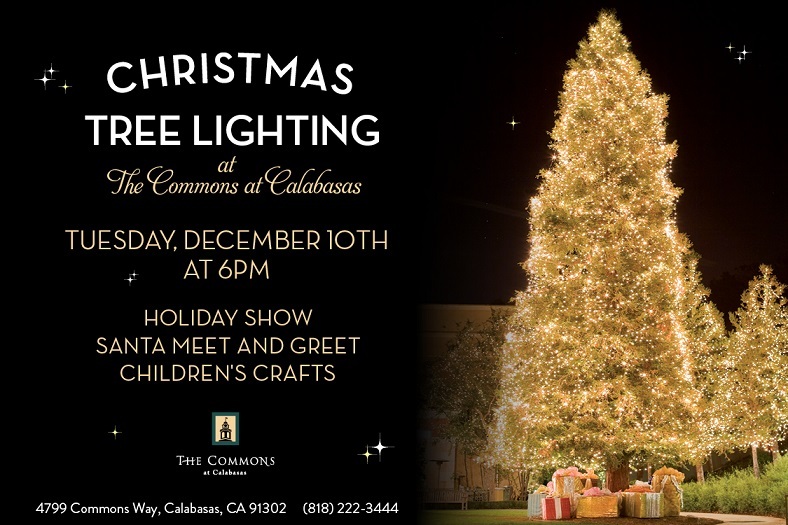 Jim will also be making it snow indoors at the conclusion of the magic show. The kids love dancing in the snow! Jim’s Christmas Magic Show is presented by “Kids Club” and is part of their “Christmas Fun @ Waterside” event. 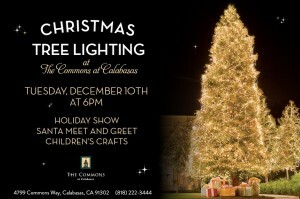 Santa Claus will also be at the event for all the young and old to meet and greet. Jersey Jim offers many holiday themed magic shows. In addition to his Christmas Magic Show, Jim also performs his famous, “Frosty the Snowman Winter Magic Show.” This show offers a secular way to celebrate the winter season, and features the appearance of Frosty the Snowman as it’s big finale! Jim also enjoys presenting his “The Magic of Hanukkah” magic show at winter time. This entry was posted in What's Up Jersey Jim? 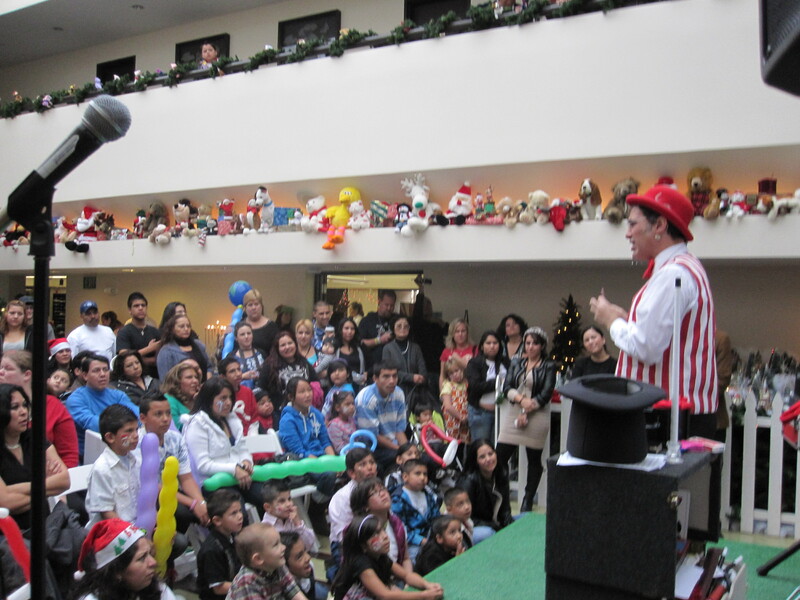 and tagged Christmas Magic Show on December 16, 2014 by Jim. Jersey Jim Comedy Magician Will Be Appearing At Giggles N Hugs at the Glendale Mall! 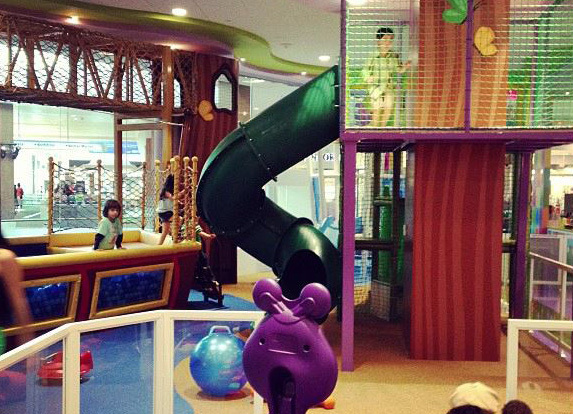 The Giggles N Hugs is a great children’s play area / high-end family restaurant. In fact, it is the premiere family spot in the Los Angeles area. If you have young children, you should go to Giggles N Hugs because both you and your children will love it. 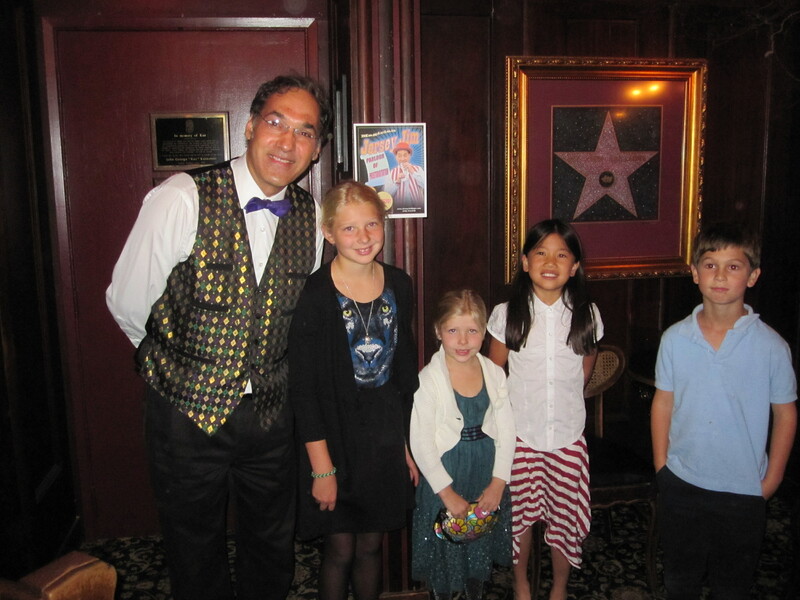 Many Hollywood stars frequent the establishment with their young children, and Jim has performed there for some of the biggest names in the entertainment industry, Jersey Jim is their favorite kid’s magician. 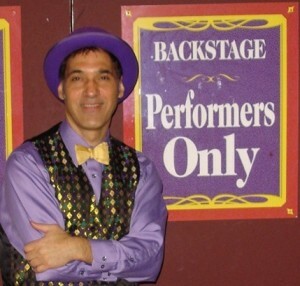 If you are holding your child’s birthday party at Giggles N Hugs, you can even request that Jim perform a private birthday-themed magic show for your child. DRACULA’S FLOATING SKULL! Look out! Later in October, Jersey Jim will be performing his spooky goofy “Big Boo Halloween Magic Show” at all three Giggles N Hugs locations: at the Glendale Mall, the Century City Mall, and their Topanga Canyon store location. Be sure to wear your costumes to the show! Children Love Jersey Jim’s comedy magic shows and so do parents. Parents typically come up to Jim to tell him that his comedy magic shows “Made our evening!” And that he’s the funniest and best kid’s magician they have ever seen. That is why Giggles N Hugs have Jim back time and time again. 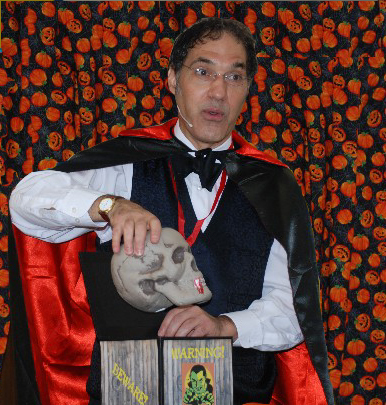 During Jersey Jim’s comedy Magic shows, all the children will be able to help “make the magic happen.” And every child will also receive a FREE magic trick from Jim after they pet Rocky, Jim’s live rabbit, after the show! Professional magician Jersey Jim is one of the busiest family entertainers in the Los Angeles area. 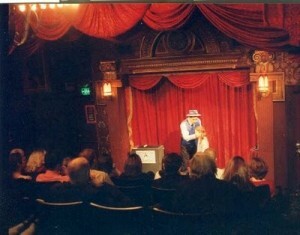 He regularly performs at the world-famous Magic Castle in Hollywood. He also appeared nationwide in the major motion picture, “Couples Retreat” staring Vince Vaughn. “It was an honor being picked by Vince Vaughn from all the other magicians in Los Angeles,” Jim said. This entry was posted in What's Jersey Jim Up To? on September 3, 2014 by Jim. Well, I just finished my shows at the Magic Castle this weekend and it was another great experience. I heard time after time from so many of the audience members that they loved my shows. The word got through to the top brass because they have asked me to come back asap for another round of shows. It was extremely busy at the castle this weekend. Every one of my magic shows were standing room only. In fact, Sunday was so crowded that I had to add a 4th show that day to accommodate all the Magic Castle guests. It was a great weekend at the Magic Castle for another reason: three of my favorite fellow magicians were there as well. Below is a picture of me with J. Neal. Jonathan Neal is the classiest, most creative, talented, and charming magician I have ever seen. J. Neal works constantly because he is in such high demand. He has helped me in my own magical career by giving me advise about everything from how to hem a silk handkerchief to how to make a sleight of hand steal. Below is a picture of Jersey Jim comedy magician with J. Neal. 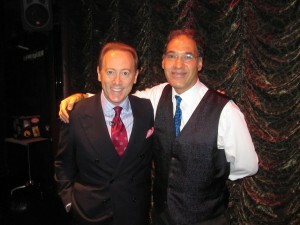 This was taken backstage in the Palace theater at the Magic Castle just a minute before his show was to start. My show in the parlor had just concluded. Another cool thing was that I tried out a brand new magical routine at the castle this past weekend. I opened all my shows with this new routine. I have to confess that these were the first times I had ever performed these routines! You should never do this but I did! I had a strong feeling that the routine would play well and I was correct. It did play well. Normally, you should work out a routine very extensively before presenting it. I did on the job training with this one, however, and by Sunday it was fairly well polished. Well that’s all for now. I will let everyone know when Jersey Jim will be returning to the Magic Castle in the future. Until then… magically yours, Jersey Jim Comedy Magician. This entry was posted in What's Jersey Jim Up To? on July 22, 2014 by Jim. Jersey Jim will be performing at the world famous Magic Castle in Hollywood on Saturday and Sunday, July 19 and 20, 2014. Jim will be bringing his special blend of comedy and magic to the Parlor of Prestidigitation which is one of the three main performing stages at the Magic Castle. Jim will be presenting family shows which are open to children as well as adults. Jim will be presenting three shows each day at 11:30 AM, 1:00 PM, and 2:15 PM. After watching Jim shows, you may also watch the Palace and Close-up room shows as well. The shows are timed so you move from one to the other. Many people come back to enjoy Jim’s show again later in the day. The Magic Castle is considered the most prestigious venue for magicians to perform. Magicians come from all around the world to perform there. 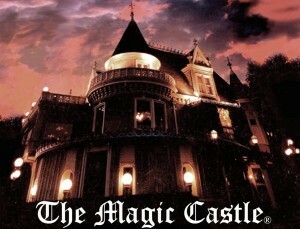 The Magic Castle is a private club and is open to the public by invitation only. 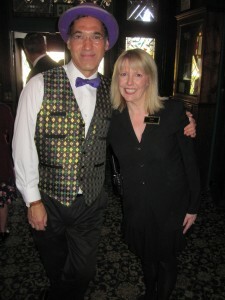 You have to be invited by a Magic Castle member or by a Magic Castle performer (like Jersey Jim!). In the evenings, there is a strict dress code. Many women love the excuse to dress to the nines when coming to the Magic Castle. The Magic castle is an amazing place to visit and experience besides watching world-class magicians. 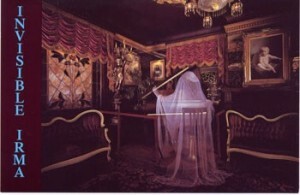 Be sure to stop by and visit Irma the ghost who will play anything you request on her piano. 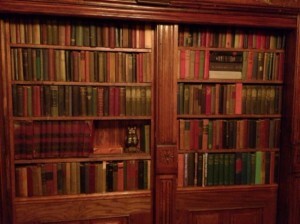 The Magic Castle also houses one of the world’s greatest collection of books and media on the art of magic. Jersey Jim enjoys studying in the magic castle’s library which is only open to fellow magicians. 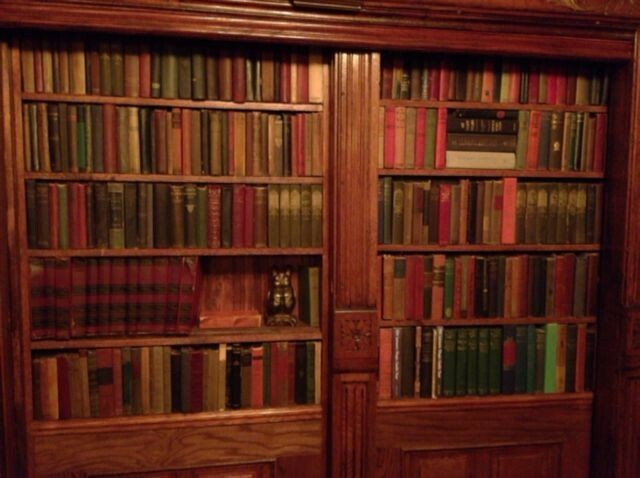 Jim says he has discovered some of the deepest, forgotten secrets of magic in the Castle’s library, including some little known methods by Houdini himself! Jim says that performing the Brunch shows at the Magic Castle are particularly challenging because you must play to what is called an “unlevel headed crowd.” This means an audience of all ages, from children to adults and seniors. Some of the Brunch shows are filled with children and some (particularly the later ones) don’t have any children at all. To handle this, Jersey Jim has crafted a show that can appeal to all ages. The material is very strong adult-style magic, and Jim adjusts the presentation of the routines based upon the ages of his current audience. When you first enter the Magic Castle, you are greeted by the Hostess. She will check to make sure your name is on the list to gain access to this exclusive club. After you are checked in, the fun begins right away. You can only gain access to the Magic Castle through the secret door! You must speak the secret pass word to the Owl with the glowing red eyes who sits on the book shelves. Only then will the secret door open and you can enter the world of fun and amazement at the Magic Castle, where Jersey Jim performs. 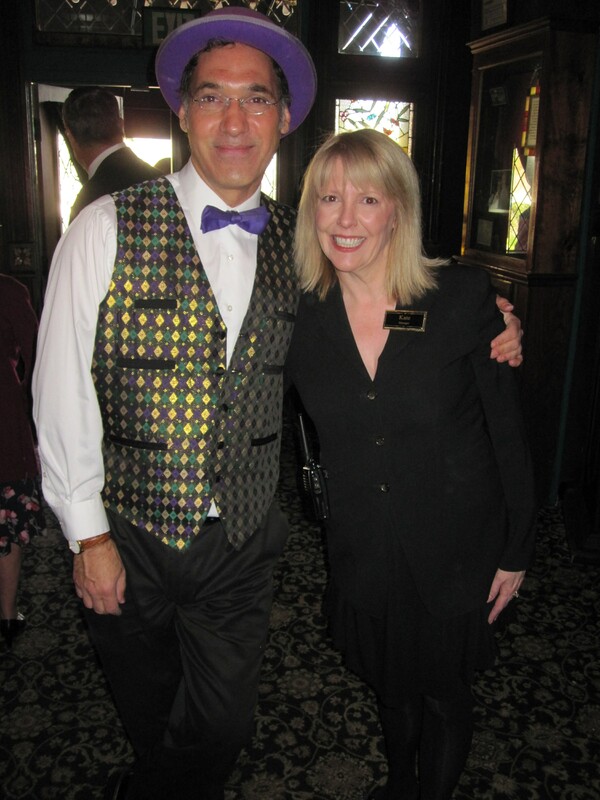 To get a preview of what Jersey Jim’s Magic Castle shows are like, watch the video of Jersey Jim Comedy Magician performing in the Parlor of Prestidigitation at the world famous Magic Castle in Hollywood. This entry was posted in What's Jersey Jim Up To? on June 26, 2014 by Jim. Jersey Jim Does Street Magic This Sunday! Street magic was one of the secrets that makes Jersey Jim the acclaimed comedy magician he is. That is because Jim gained thousands of hours of performing in front of live audiences in his early career by performing on the street. Street performing is considered the most demanding test of a magician. That is because if you are uninteresting for a few seconds people will simply walk away. Jim gained vast experience with audiences of all types and ages and cultures which proved an invaluable asset as a performer. He was also able to hone his routines, jokes, and magical sleight of hand through these performances on the street, working hour after hour in front of new audiences all the time. 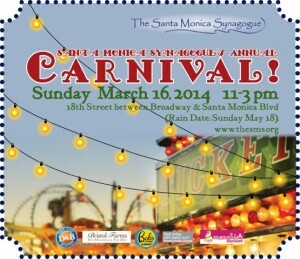 Jim loves street performing so if you want to see how much fun it is, come to Santa Monica at 18th street and Broadway this Sunday. 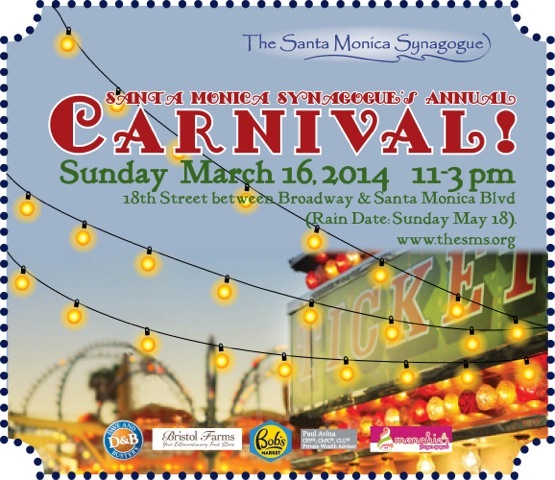 The carnival is also sure to be a great time with food and fun rides for the whole family. Comedy magic is so much fun and doing comedy magic in the street environment, where the audience gets immediately involved makes it even better. This entry was posted in What's Up Jersey Jim? on March 14, 2014 by Jim. This entry was posted in What's Up Jersey Jim? on December 10, 2013 by Jim.